In October 2005, five scientists were marooned on a mountain near Yuan Yang Lake in Taiwan. Dead-set on installing a new batch of water quality sensors, the group had ignored an incoming typhoon that washed out the only road behind them, knocking chunks of pavement the size of a garage down the cypress-covered slopes. The scientists, some of which would go on to co-found the Global Lake Ecological Observatory Network, hiked and hitched rides until they made it back to their hotel two days later than planned. That’s a simplified version of the journey, but know that it was impressive enough for one of them to write a two-and-a-half-minute song about it. It’s a symbolic story in GLEON’s history for two reasons. First, they succeeded: They managed to install the sensors at one of the sites (along with others in Wisconsin) that would make up the first-ever global lake monitoring network. 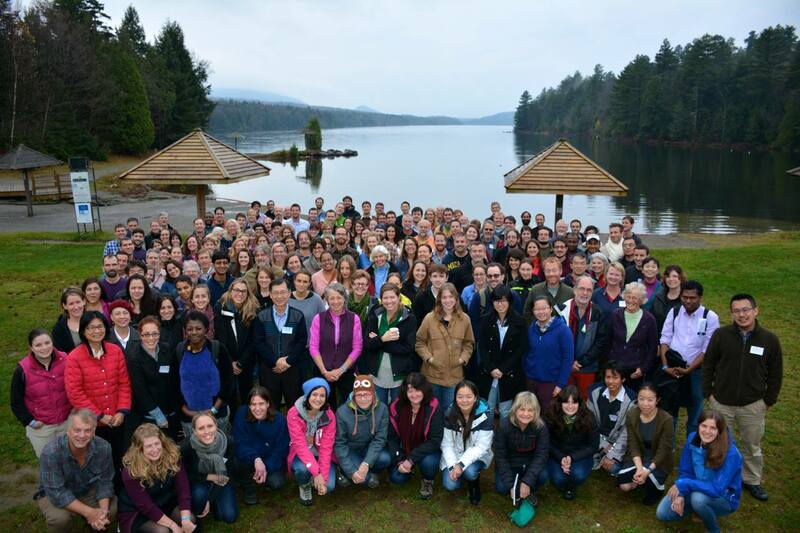 A network that has for 10 years now enabled internationally collaborative limnology research that repeatedly covers new ground in the discipline. Second, the story is more about the people than the data. As an undergrad in 2006, she helped launch the data buoy on New Hampshire’s Lake Sunapee, now a prominent site in the network. She spent a year at Uppsala University in Sweden while researchers there where coincidentally installing a GLEON buoy in Lake Erken. From Sweden she could easily attend the observatory network’s fourth official meeting held in Finland that year. There, a car ride with current co-chairs Paul Hanson and Kathleen Weathers led her to found the GLEON Student Association. Though the association’s original aim was to improve the student experience, she said it has gone on to benefit the network’s culture for students and senior professors alike. Now Carey has her own lake station in Virginia’s Falling Creek Reservoir, qualifying her for another GLEON benefit. something she called buoy therapy. “Buoy therapy is what happens when your buoy isn’t behaving,” Carey said. “Buoys break and sensors get lost and computers fall to the bottom of lakes.” A GLEON listserv gives them resource for both troubleshooting and commiserating. She also has her own students in the network’s student association. GLEON was right at the front of a trend in ecology towards broadly collaborative research, said co-founder Peter Arzberger. And the student association pushed researchers to think about how collaborations can be more effective. Arzberger was among those stranded by the typhoon, the group’s fifth man who stood on the lakeshore while the others took their four-person boat out to install the sensors. Those early stations let the researchers compare lakes in Taiwan and Wisconsin, leaving them to wonder: Why stop there? So he and fellow co-founders Tim Kratz, Fang-Pang Lin, David Hamilton reached out to other scientists that might be interested in sharing information about lakes gathered through emerging sensor and wireless data technologies. The result was their first workshop in 2005 — the event that makes this year GLEON’s 10th anniversary. The first meeting generated enough interest to have second and third meetings, and suddenly the group had to think about things like funding, governance and how all these international scientists could go about working together. Funding came from the Gordon and Betty Moore Foundation and the National Science Foundation. And the system for working together the GLEON uses is one Arzberger says he wasn’t seen anywhere else. It’s a three-light system that assigns a green light to projects with an idea that still need collaborators and direction, a yellow light when the group is converging on who is going to do what, and a red light when the data is collected and ready for publication. That strategy has eased the way for the network of 500 scientists and 150 lake stations to link up and conduct cross-site studies, which often produce findings that wouldn’t be possible with a single-lake study. For example, a 2012 study looked at dozens of temperate lakes to show that surface area influences the relative roles of convection and wind shear for mixing within the surface mixed layer and inducing gas exchange. The smaller the lake, the more influence convection has on the mixed layer. GLEON still has issues to overcome, Arzberger said. Scientists still share data through spreadsheet files that have to be cleaned up so the numbers are comparable between lakes. Requiring a unified scheme for data collection isn’t feasible with a grassroots network of member sites that are collecting data under different funding environments with their own data regimes. Another concern is tracking the use of shared data. Members are usually happy to share data from their sites, but their funding agencies often want to know who’s using it. That could be helped by developing digital object identifiers for datasets and building an ethic among members to cite those identifiers when they use someone’s data. Social matters like that are important to GLEON, and the network’s social culture will be in full swing at its 17th meeting in South Korea this October. “Like many things in life, you start something not knowing quite where it’s going to go,” Arzberger said.